Lots of personal stuff got in the way, including my grandfather's passing. I've been thinking a lot about this game and was just about to give up on it, due to not finding clarity about its purpose and gameplay. Today I launched it again and had some fun tweaking stuff, got some motivation to work a little and ended up spending my entire day doing improvements. Today I tweaked a lot of the simulation stuff, to slowly introduce life forms. Right now only microscopic life exists, which is introduced in the 2nd era and will allow grass and marshes to appear. I also decided to disable many of the different play modes I tried, because I didn't find any purpose for them. So right now the game map expands without limits, but the player has to place new blocks in the edges of existing tiles (no free place). Today's update includes many new shiny things (well, almost). 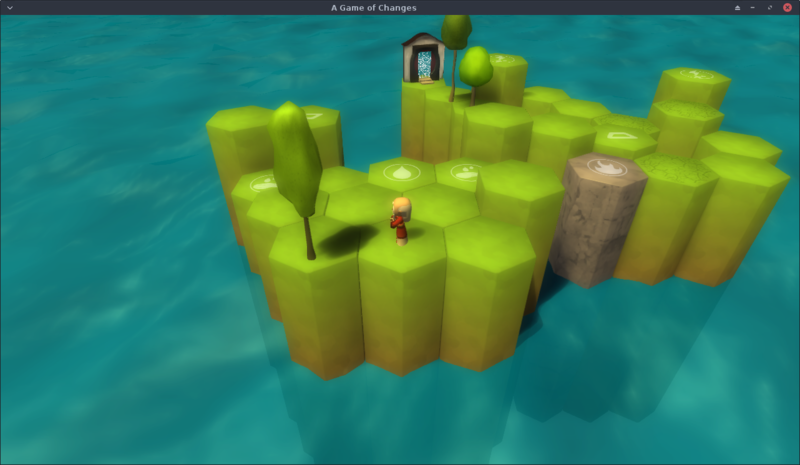 Now the game has a camera, which moves around with the player, so the map can be bigger than the screen. This will be one of the "disasters" that will appear in the game. Not sure if the player will "place it" at will, or if it appears by its own. Right now the game has 4 main eras (stages). Each era has a different speed for the simulation, and different tile types become available of disappear. In the first era (terragen), the player can only place water, desert/bare, volcanoes and mountains. In the 2nd era, life is introduced (not sure how), so grass/forests and everything else will appear. I'm at a "fork on the road" right now, trying to figure out where to go from here. Still not sure if the whole Tetris thing is going to be too disruptive to the simulation aspect or not. The game is divided into Eras(levels), which will advance as time passes by. Each Era has its own game speed (on the simulation level), and introduces more complexity to the game. 1st Era is like a terra-gen level. You can only place mountains, deserts and water tiles. Basically, laying out some parts of the map. 2nd Era life begins. 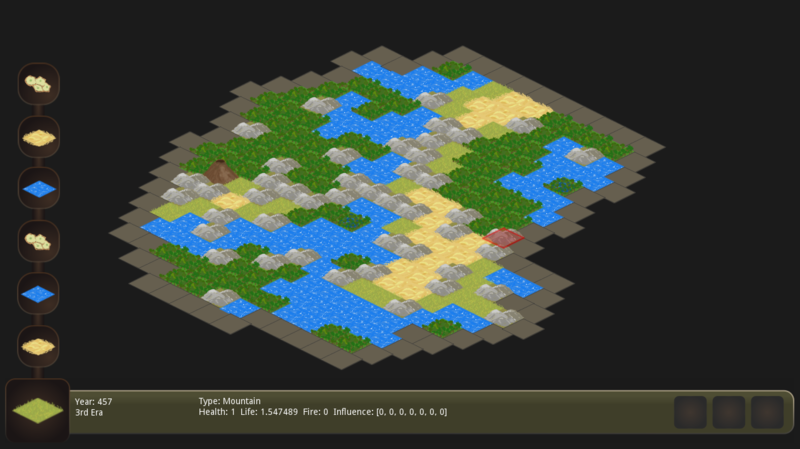 You can now place grasslands, forests, and the simulation will also create marshes and swamps. 3rd Era life develops. Animals and pre-historic human beings? Not sure how to pull this, but as humans develop they will have an impact in the tiles around them. For instance, in the modern era, too many cities in one place means water will become polluted and forests die out. made some minor UI improvements, and also coded a few options to allow for (possible) future gameplay modes. Ok, first basic simulation code done. So for now I'm making it simpler just to get things moving, and then I'll come back to it later to add more complexity and realism. I expanded the cell types to 7, now including desert, marsh and swamp. While my mind races with ideas on how to expand and make this a complex-and-interesting-enough simulation, I'm for now trying to come up with a "minimum viable product" and then iterate from there. I'm basically trying to decide on the cell "types", and how the interaction is done during the simulation. For a start, I'm considering a basic set of : plains, water, mountains and forest. Unlike Conway's game of life, the simulation wont happen per "cycle", but will be more realtime. I don't want tiles to change suddenly, but to allow the effect of neighboring tiles to affect them gradually. When a certain threshold is met, then the tile changes. The question now is how to make each tile affect tiles around it, and what are the conditions and triggers to begin affecting tiles. I've been thinking in a way of how certain tiles help others to thrive (in terms of life), damage it, or are neutral. 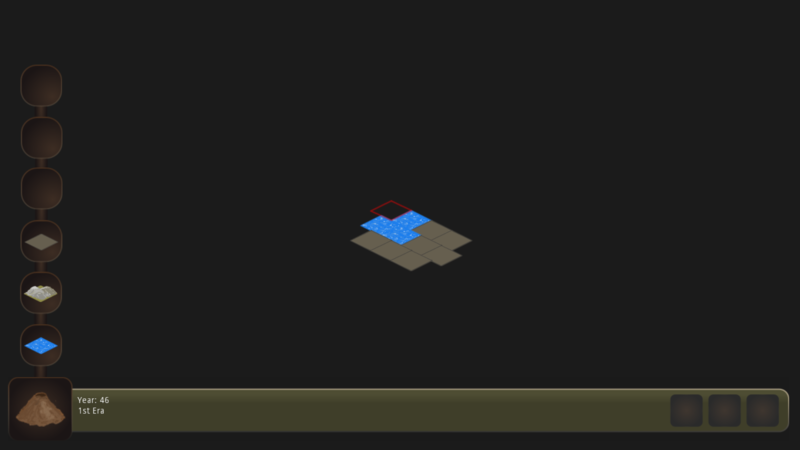 For instance, a water tile is beneficial to a forest tile. But perhaps if there is too much water surrounding just one forest tile, it might turn it into something else, like a swamp (forest+water). In this case, it gets really complex, because I need to consider how each tile might affect other tiles individually, not just in terms of being positive or negative. Frustrated with my latest developments, I decided to work on a small scale game, which I plan to finish in just 1 or 2 months. It's a game-of-life simulation, but using lots of different cell-types, which interact differently with one another. 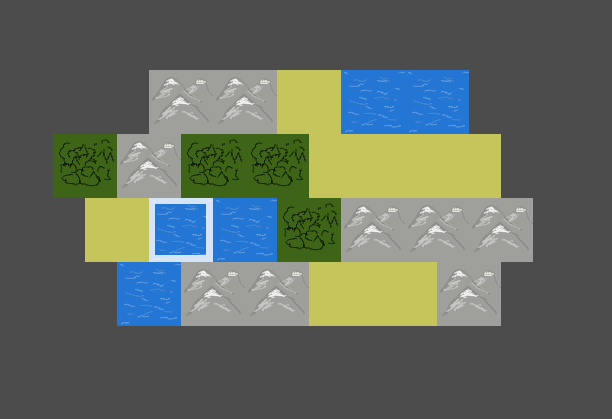 I'm using natural elements, biomes, etc for cell types (for now: water, plain, forest, mountain). 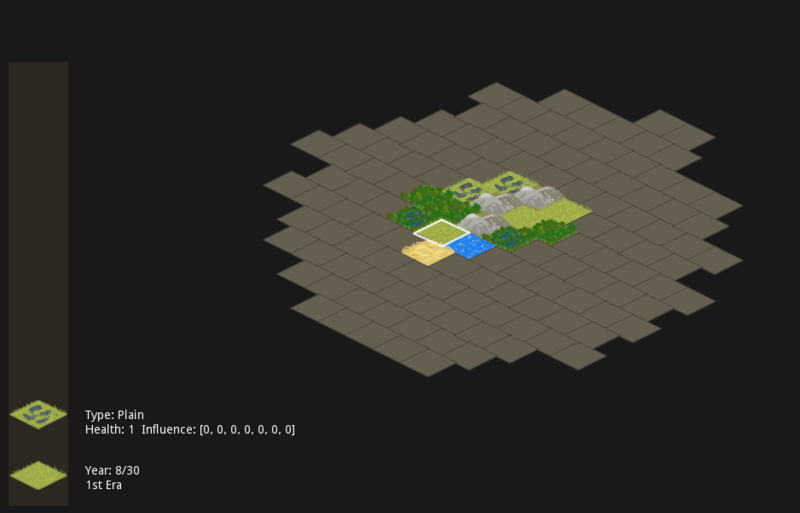 Eventually add complex things, like human villages (or cities, as the game-time progresses), maybe animals. So where does Tetris come in? You receive "blocks"(cells), just like in Tetris, and you can place only the head of the stack, after which the next one will be available. So not only you have to manage the simulation going on (and try to make it Thrive! ), but also paying attention on how to use the blocks you have available. A week ago I released my latest game: Satellite Repairman. It's available for Win, Mac and Linux. In a few days I'll be uploading an update that adds internationalization support among other features. In the meantime, I've been taking a few more screenshots here and there that show some new levels. On the Steam side of things, the greenlight campaign is really slow. Been trying my best to get the word out, but these kind of niche-oriented games are really hard to be noticed by big sites. And even the medium ones dont make much difference in bringing people to the page and vote. itch.io Community » General » General Discussion · Created a new topic Where/How can I find chinese gamers? 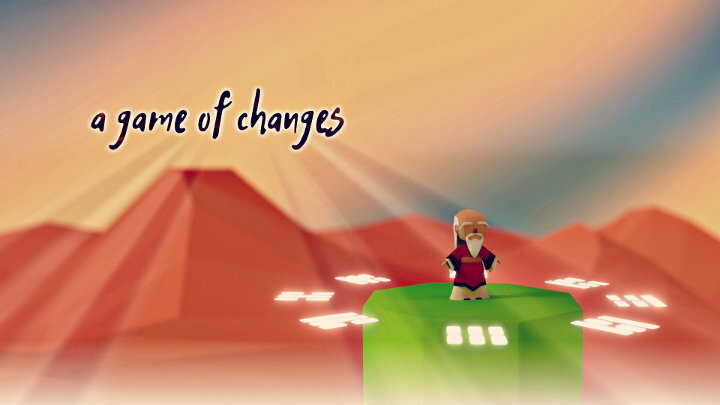 I'm working on "A Game of Changes", a game inspired by the ancient chinese classic "I Ching". I will also have the game fully available in Chinese. yesterday I launched my greenlight page (http://steamcommunity.com/sharedfiles/filedetails/...) and now I'd like to be able to reach chinese speaking gamers, but no idea how. I tried some searches online but only end up reaching big gaming portals. Hi folks! Sorry for not updating this for some time! Lots of changes have been made, the game is improving a lot! Finally implemented the walking animation into the game. makes a ton of difference :) suddenly it feels more alive! A new tile effect has been added to aid in the mechanics and create interesting puzzles. You can only step on this tiles once, after they they disappear (need to work on the "disappear" effect, I know). This effect can be applied to any tile, even if it has other functions too. Don't forget there's a google form to subscribe to the game's launch notifications. See you next week or, for daily news, get your info via twitter or the devlog at tigsource. Another week passed so here's another A Game of Changes summarized devlog! Life got in the way a lot during this week so I couldn't move forward so much as I wanted to, but still many new things got done. 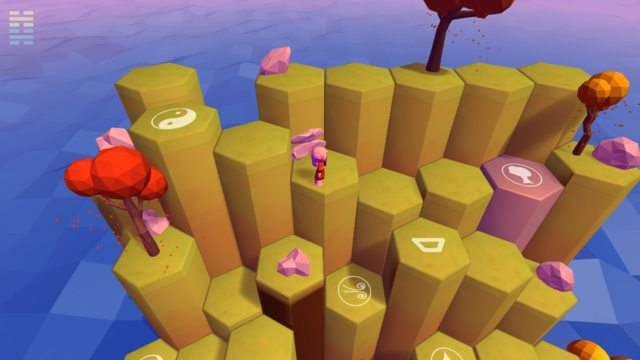 Rock tiles are also not affected by the "flip", so this will allow some interesting puzzle mechanics. Nothing of this is final for now, I'm still testing and working out what works best and provides a good playing experience. 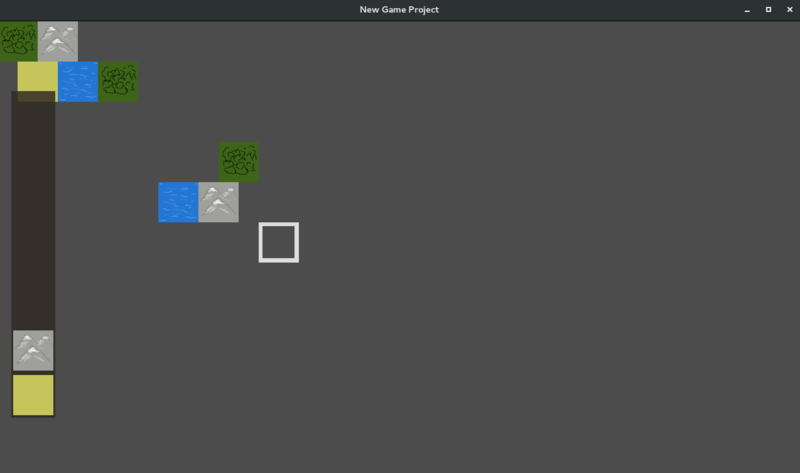 And finally, I started working on the first draft for a tile texture. See you next week or, for daily news, get your info via twitter or the devlog at tigsource. These past days I've been introducing a few more mechanics to make the puzzles more interesting and challenging. No code done yesterday. just worked on UI and art. A lot of the core mechanics are done, just a few remain to do.. but I still have to decide about them before coding. Godot is really nice to work with, the way the scene tree works allows for some really quick level building and easy changes to the whole game. Chance and destiny find themselves interlaced in A Game of Changes. Journey through the 64 unique puzzle levels that draw inspiration and teachings from one of the oldest classic books in human history, the I Ching (Book of Changes) whose unique wisdom originates from philosophical and scientific observations of the laws which rule existence. It invites us to conscientiously look within, at one's own personality, character, perspective and purpose while inspiring us to discover the one unspoken, unmanifest, unchanging truth. I'm developing the game using the Godot engine in Linux, with a bunch of other free software tools like Blender, Inkscape, Audacity, and the like. itch.io Community » itch.io » itch app Development · Posted in Löve 2D .love file support? I tested today with my own game, and running in Linux is not supported. The app doesnt do anything when I click run.